I didn’t always write short stories. Like many of you, I tried to write novels. I tried to write one in high school and got bored ten pages into it. I tried to write one in college and got stuck after just a week. After college, I wrote fifty pages of one before I threw it away as garbage. A few months later, I discovered writing short stories. It can take years to write a novel, a daunting commitment. And if you’re just starting out, the end product probably won’t be very good. That’s why short stories are so helpful. They give you the chance to finish a whole story in under a week, and by getting your writing into the world sooner, you’ll start to build a reputation and a career as a writer while also improving at the writing craft faster. Besides all that, writing short stories is a lot of fun! When I first started trying to publish my short stories, I quickly became overwhelmed. There are thousands of literary magazines publishing short stories today. With so many to choose from, how was I supposed to know which ones would accept my work? After years of exploring the literary landscape, I wanted to make it easier for other writers to understand how to get their short stories published. Let’s Write a Short Story! doesn’t just teach you how to write a short story. It includes lots of helpful resources that will save you all those hours of research I had to do. It will also tell you the secret to getting agents and publishers interested in you, and how to build a publishing platform using short stories rather than blog posts. In the end, it will help you build a career in writing, not just another fantasy. It’s about taking your writing and your career seriously so you can create the art you’ve always dreamed about. Ready to write your story? Get the book here. Joe Bunting is a professional writer and editor. In 2011, he started The Write Practice, a blog for creative writers based on daily practice. Since then, The Write Practice has won numerous awards and has been featured on some of the top websites in the world, including Copyblogger, Glimmer Train Stories, and Write to Done. He has written newspaper and magazine articles, blog posts, non-fiction books, and, of course, short stories. In 2011, he married his wife Talia, whom he met through a blog. They live in Atlanta with their two sons. You can follow Joe on Facebook and Twitter. Get the #1 Bestseller Today! Let’s Write a Short Story! is now available! Get your copy and find out how to start your creative writing career today. “This book is an excellent primer for those wondering where to start developing their writing talent. 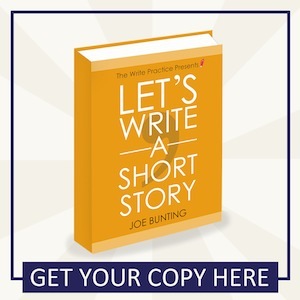 Painless and simple, let Joe’s book walk you through the world of the short story and motivate you to pen a weekly tale, teaching you to take baby steps then more as you become a writer of substance. Join the free newsletter and get notified about story workshops, new ebooks, and other updates.